Do you remember this curbside rescue that my teenager brought home for me…. Sept 13th?? 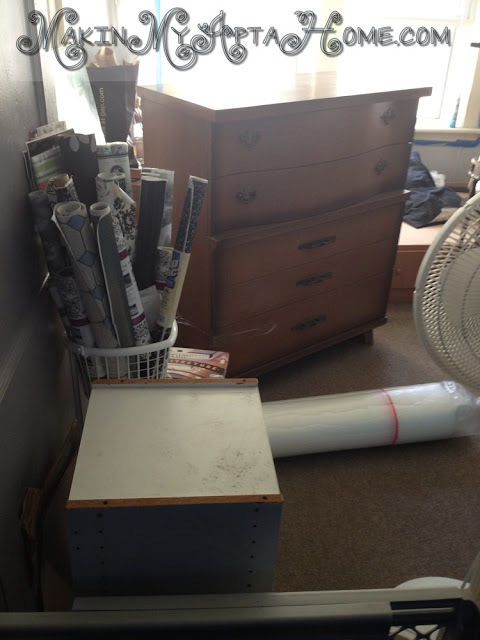 And do remember how crazy my “Crafty/Project/Guest” room was looking with it and everything else inside?? I used a wallpaper I had purchased back when redoing my bar that did not make it to the bar but luckily now came in quite handy don’t you think?? love that design, you did such a wonderful job!!! 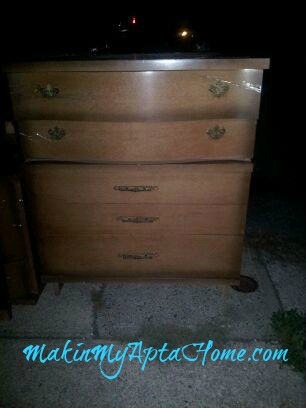 How fun to breath new life in a old dresser! Wish I had her in my closet!! Fabulous dresser!!! I’d love for you to share this at my link party Submarine Sunday. It’s open until Friday @ 11:59pm. I hope you’ll stop by! This dresser is so, so pretty–love the light bluey-green outside in contrast with the bold black and white wallpaper on the drawer fronts! Love this and makes me think creatively as I hunt down a dresser for my daughter’s room! Thanks! You’ve done it again – it’s absolutely GORGEOUS!!! I love it! Love the hardware, too! My favorite color! Love the silver handles too! Hi! I’m visiting from Shabby Creek Cottage. I’m wondering what the heck those sticks or blocks or whatever are underneath the dresser in your closet? What happened to those “feet”? OH WOW!!!! It turned out AMAZING!!!! Thanks so much for sharing this at The DIY Dreamer… From Dream To Reality!! I can’t wait to see what you link up this evening! Very cute! 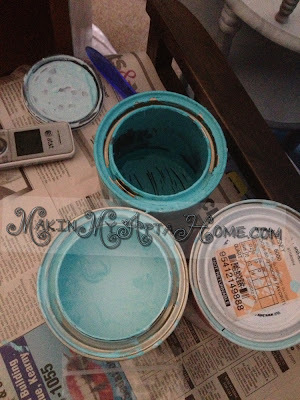 Love the teal, I have some rescues in need of makeovers right now. Thanks for the inspiration and for linking up! That just completely changed the personality of that little dresser! Hi and wow how stunning the dresser came out! You did a great job with the makeover and I saw it on throwback thursday. It looks so fantastic in the Tiffany blue color (one of my faves) and the bold black and white print is so chic! Great job! Yes, I’d be keeping her too!!!! So pretty!!! What a cute update! Thanks for sharing at this week’s Throwback Thursday party. Love your dresser so much! The colors are so glam. Black, silver and tiff blue..who knew?